Until the opening of the Barrington Center for the Arts in fall of 1999, Gordon’s Art Department was nomadic, moving between locations—the basement of Bromley Hall, a shack in the woods, Drew Hall, Roosevelt and a trailer behind the former Prince Chapel. 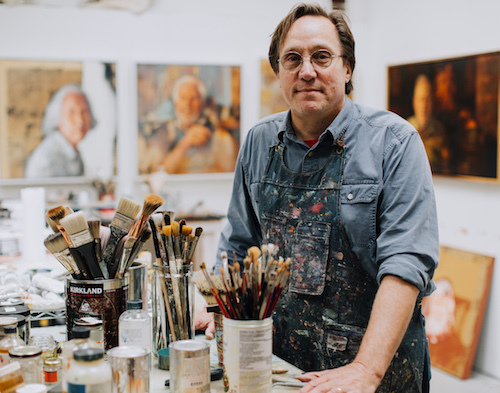 “A lot of pioneering students in those days have gone on to become terrific artists, designers and teachers,” says Professor of Art Jim Zingarelli. From the makeshift studio to the gallery, creativity is the name of the game for the Art Department and its faculty, this year celebrating their 30th anniversary. While the department graduates men and women who are traditionally trained, the students are taught to observe the world differently. Equipped with a vision to foster space for artistic ingenuity at Gordon, Herman began teaching part-time in 1984 after gathering the nerve to call the academic dean and offer his résumé without a position even open. He joined the faculty full-time four years later when his vision came to fruition and the one-man Art Department was established. As the department grew, art at Gordon encountered more milestones, such as hiring Zingarelli (who, after 22 years on faculty, is still known affectionately to his students as “Z”) gaining two galleries in Barrington and the development of the Gordon in Orvieto program, which celebrated its 20th anniversary last September. Pioneered by Herman, Zingarelli and Senior Advisor for Global Education John Skillen, the program has welcomed more than 700 students to the little Italian clifftop city that is the highlight for many past, current and future art majors. Among the highest virtues in teaching art, Herman values the importance of relationships, crediting the growth of the department to the faculty whose individual strengths and skills have expanded the program. “We’re all artists. We aren’t teachers who make art; we’re artists who teach,” he says. Long after each year’s Commencement, Herman says, he and his colleagues remain connected with many alumni. Gordon’s art graduates pursue advanced degrees at recognized art institutions, launch into artistic careers in myriad media, teach other artists at every age and are socially engaged through art all over the world. Not infrequently, they become collaborators with their former professors or return to mentor the next generations of art students at Gordon. In total, the department has equipped about 1,000 men and women with the skills and experiences to become artists, makers and friends. Earlier this in the spring semester, the Art Department commemorated their anniversary and growth with a faculty art show, Currents. On display in the Barrington Center for the Arts Gallery through April 24 is Remnant: Philip Archer. Sarah Welch ’19, communication arts, also contributed to this article.